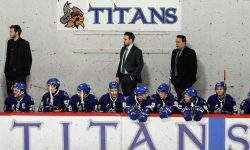 The Spartans and the Titans played 60 minutes of hockey in which 40 minutes was scoreless. Numerous body checks and rushes at each end of the rink kept the fans on the edge of their seats. The Titans had to kill off 18 minutes in total penalties and did so at an 100% efficiency. Early in the third Alex Provost Ross opened the scoring only the have the Spartans win the face off from center ice and tie the game 5 seconds later. Shortly after they grabbed a 2-1 lead. Enter the games hero EIsai Arai as he scored two goals, his second with about 6 minutes to play proved to be the winner. Emile Goulet stopped 34 shots for the win. The Titans are now 4 points ahead of the Pirates in second, but the Pirates have 2 games in hand with one them being our last meeting of the regular season in VIlle Marie next week.